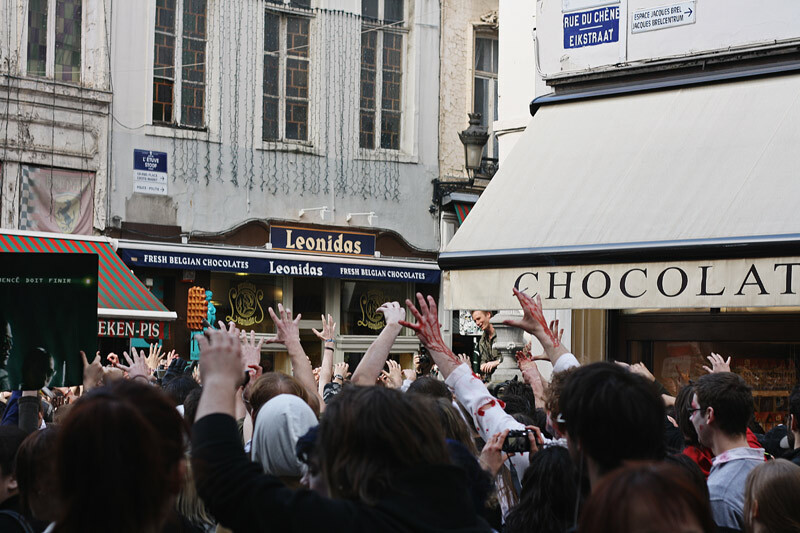 Imagine having the tranquility of your chocolate shopping disturbed by a cacophony of moans and screams. 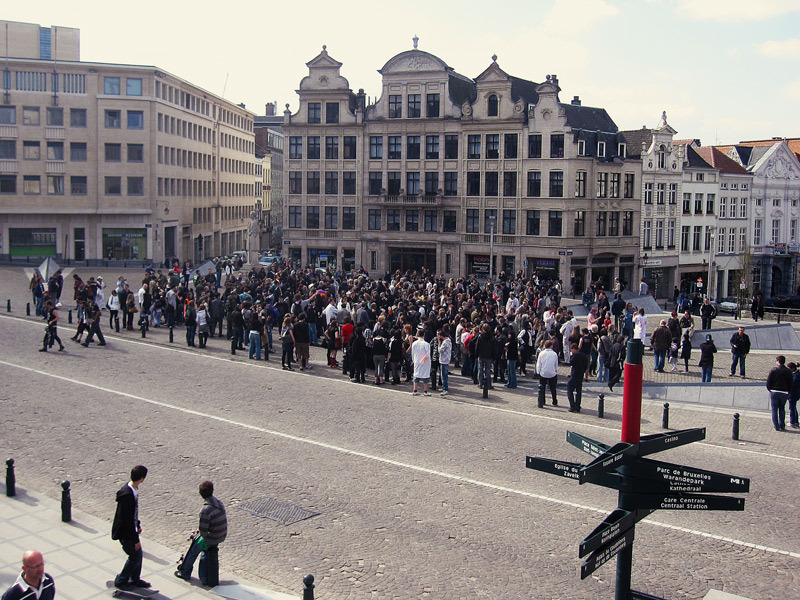 This was the scene during one of our days in Brussels. 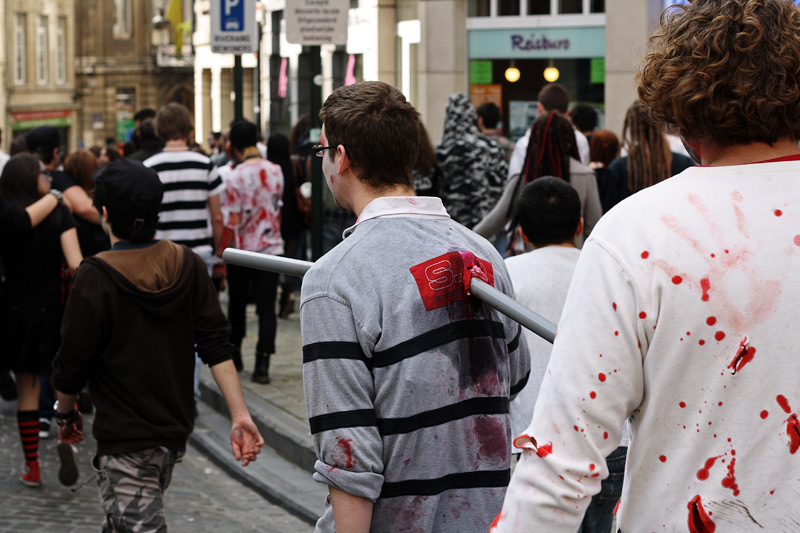 As we followed the (fake) bloodied parade to it's meeting point, we determined that we must have inadvertently found ourselves in the middle of a Belgian zombie walk. With no fixed plans for the day we decided to hang around and join the crowd. It was as amusing to walk around and see the different costumes as it was to watch the confusion of other tourist and locals upon seeing the crowd. 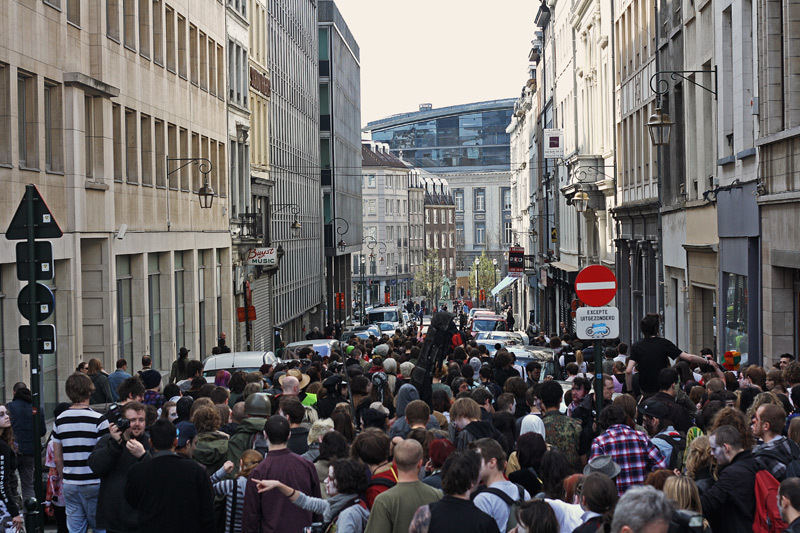 After some showboating for the cameras, and a briefing of the rules from the organizer, the walk started with hundreds of undead-costumed Belgians cramming onto the cobble stones streets of downtown Brussels. 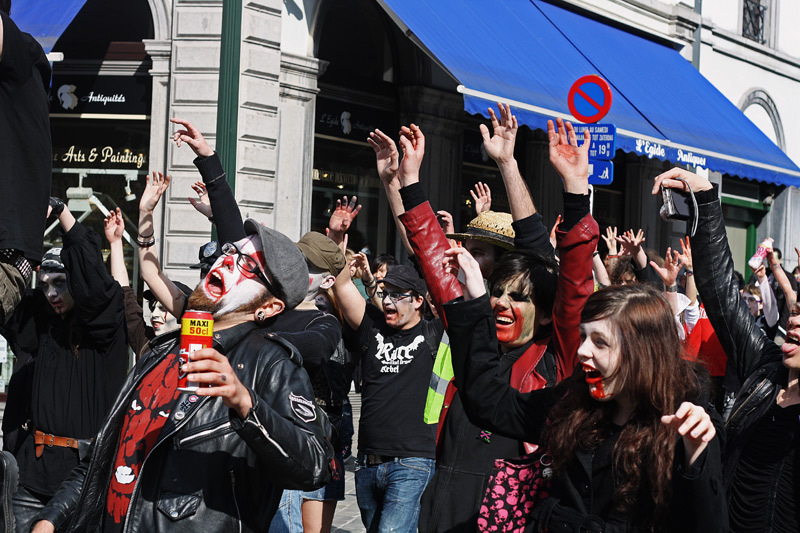 We remembered that we had "participate in a flashmob" on our wanderlist. 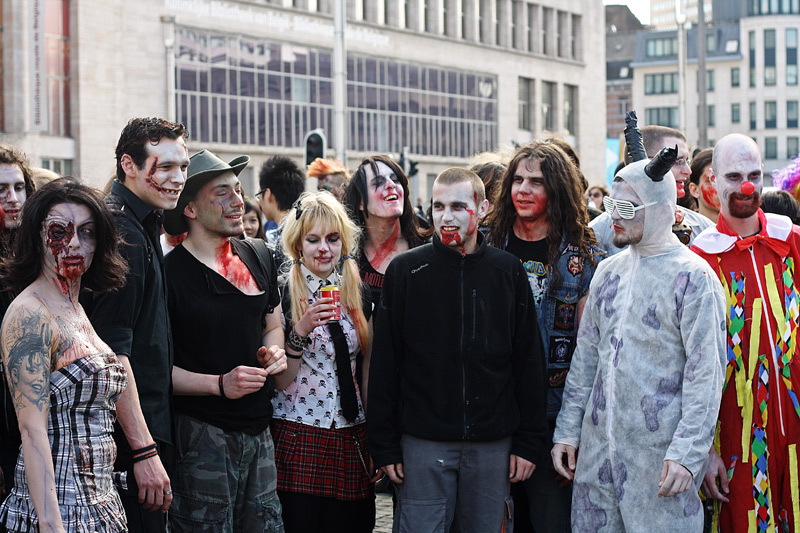 Technically this zombie walk was not a flashmob, since it was an annual event and well planned in advance, but our participation in it was spontaneous, so we figured it would count. 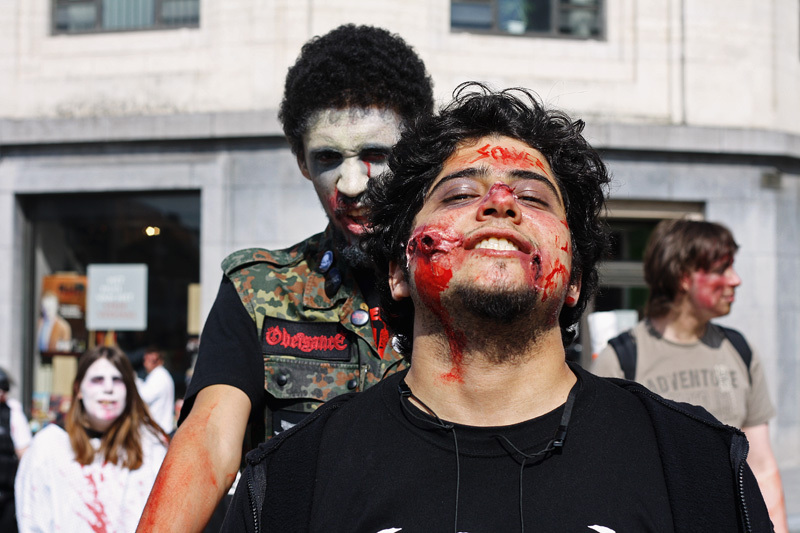 Alex volunteered to be a "victim", which consisted of being mock-infected by a large groups of zombies. Despite boo-ing all the rules before starting out, the participants were very courteous and helped the victims to their feet after dramatizing an attack. 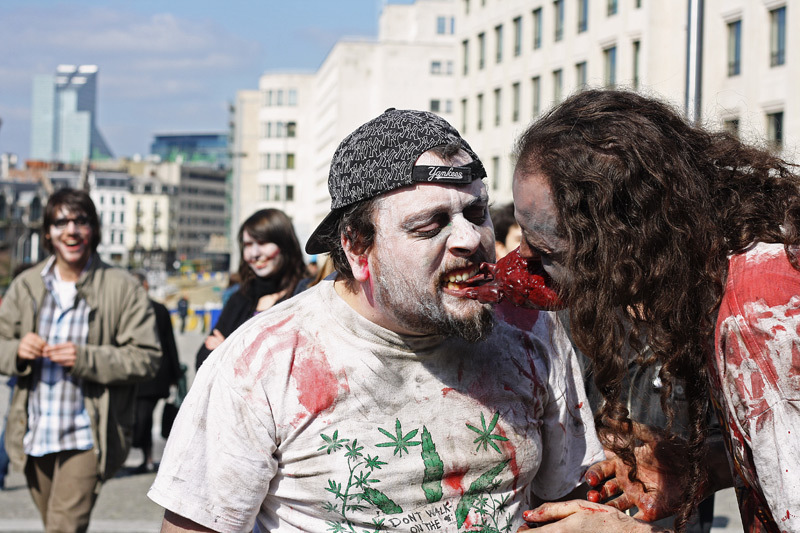 Of course, no self-respecting zombie walk would be complete without zombie-kids walking around, chants for "zombie rights" (in French), and simulated body part consumption. holy cow! they really go all out! JUst came over to say hello from Nina's blog...and found THIS. WOW...that sure was a day to remember...the makeup is awesome. I'm adding you to our FAVE and FABULOUS blog roll...I am a FAN of travel and think it's great you're doing this! That's awesome that he got to participate in that! oh wow... they mean business. this is so awesome, i can't believe this is an annual thing. 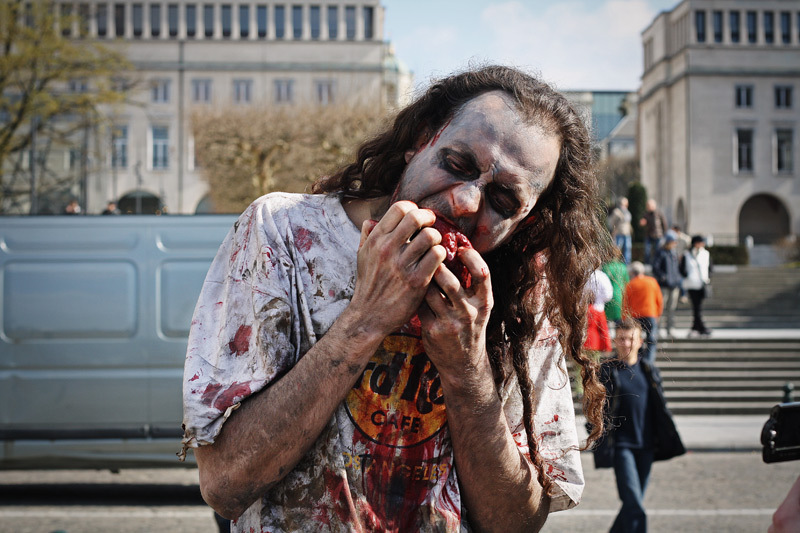 i almost want to throw up then i almost want to go see if i can make myself look that "undead"
what an incredibly cool experience to take part in! Totally jelly on that one. I'm not going to lie... that would totally freak me out! 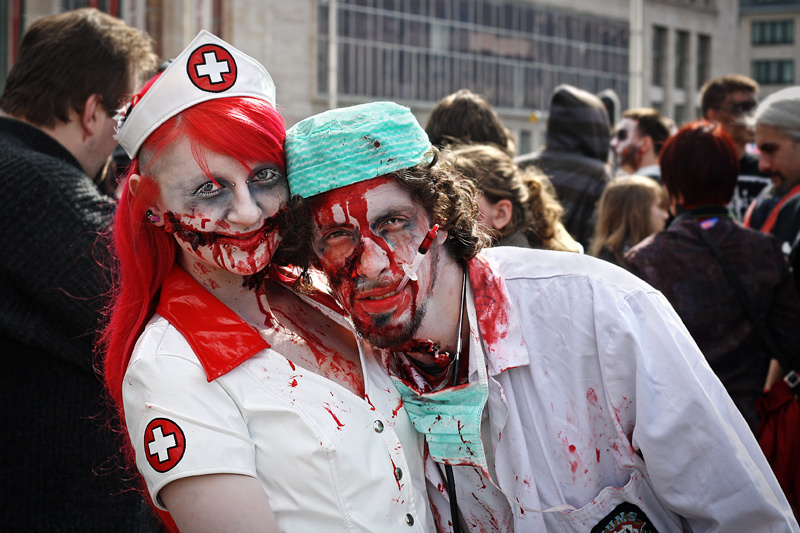 I was caught in a zombie crawl once, but in the much less interesting city of Sacramento, CA. what the h...? 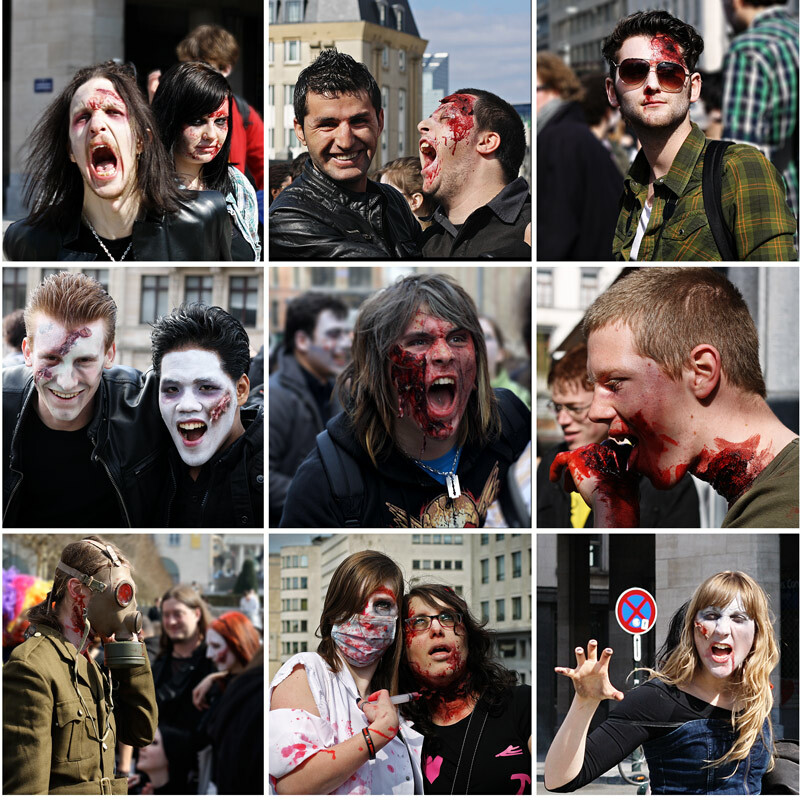 I guess they watch too many horror movies in Belgium!! Wow, this is so cool!! You guys are so lucky to encounter something like this when you just strolled around! 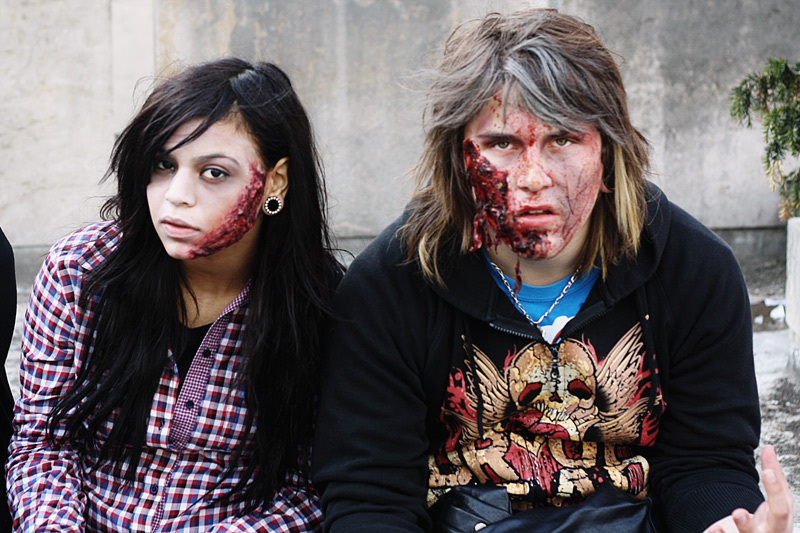 The creepy make up is also really good and realistic looking, I wonder they had some professional make up artists around to do that. 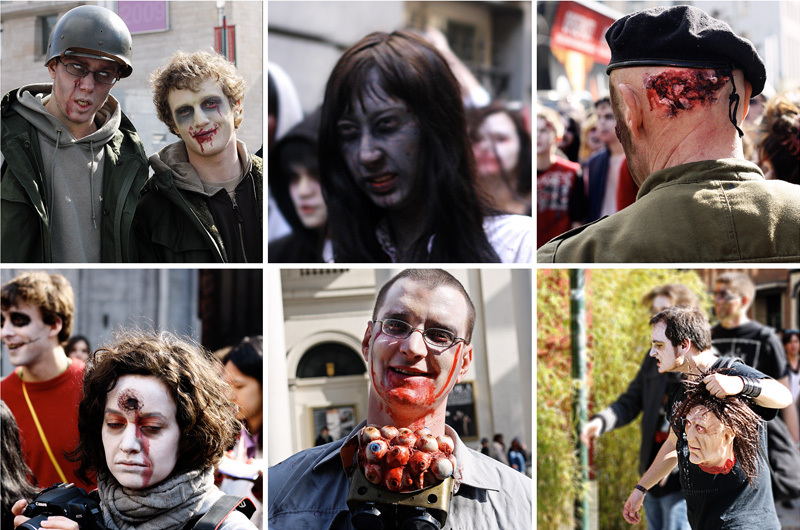 There are always zombie-walks in Toronto. I don't understand it and I won't accept it. I think that's amazing! I've never heard of this before. People come up with such good ideas. bizarre experiences like this one... that could not have been planned... are definitely my favorite part about traveling. thanks for sharing the craziness. I went back and looked at all of your Brussels post, they are so great! 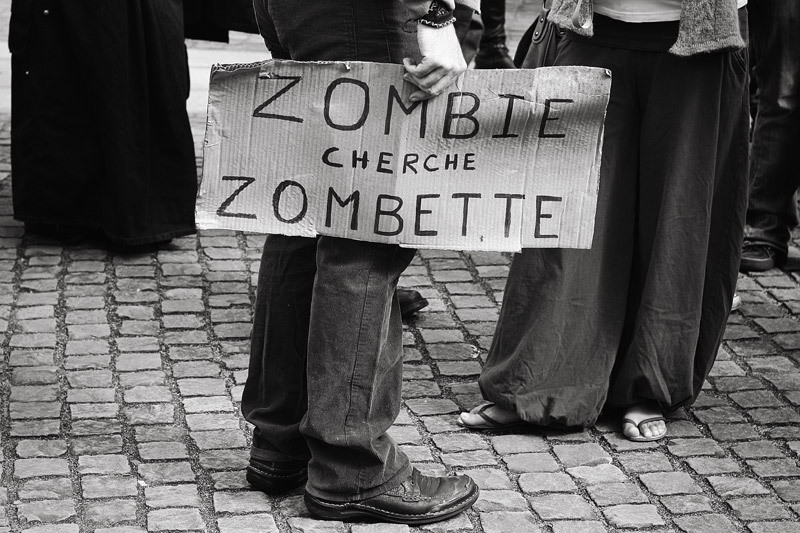 I love that you were there when the zombies were there.